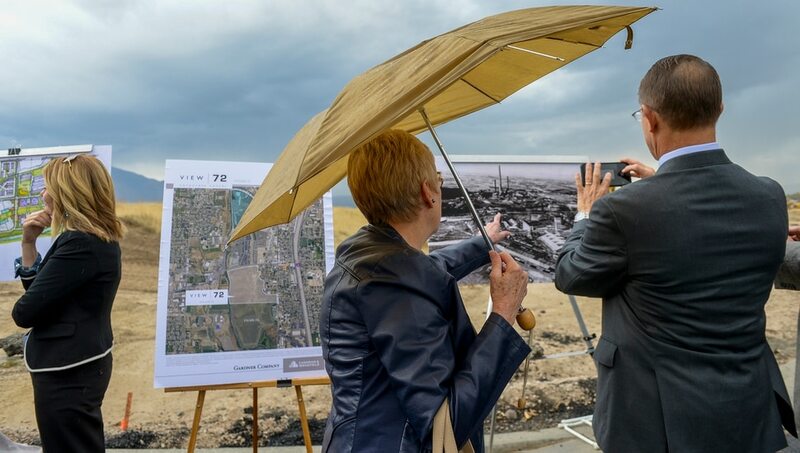 Leah Hogsten | The Salt Lake Tribune l-r Jan Litster and Ken Ivory, R-West Jordan look at an old photograph of the Sharon Steel mill that operated on the site from 1906 to 1971 after the Midvale ceremony, Monday, Oct. 22, 2018. Jordan Bluffs is moving forward with the View 72, Phase II development at Jordan Bluffs. The 265-acre parcel will be comprised of mixed-use development on the former Sharon Steel superfund industrial site. Leah Hogsten | The Salt Lake Tribune Gardner Company Board Chairman, Kem C. Gardner, Monday, Oct. 22, 2018. Jordan Bluffs is moving forward with the View 72, Phase II development at Jordan Bluffs. The 265-acre parcel will be comprised of mixed-use development on the former Sharon Steel superfund industrial site. Leah Hogsten | The Salt Lake Tribune Jordan Bluffs is moving forward with the View 72, Phase II development, Monday, Oct. 22, 2018. The 265-acre parcel will be comprised of mixed-use development on the former Sharon Steel superfund industrial site. Leah Hogsten | The Salt Lake Tribune Jordan Bluffs is moving forward with the View 72, Phase II development, Monday, Oct. 22, 2018. The 265-acre parcel will be comprised of mixed-use development on the former Sharon Steel superfund industrial site. Leah Hogsten | The Salt Lake Tribune Christian Gardner, View 72 investor and chief executive officer at the Kem C. Garnder Company thanks members in attendance who helped with the project, Monday, Oct. 22, 2018. Jordan Bluffs is moving forward with the View 72, Phase II development at Jordan Bluffs. The 265-acre parcel will be comprised of mixed-use development on the former Sharon Steel superfund industrial site. Leah Hogsten | The Salt Lake Tribune Midvale Mayor Robert Hale delivers his opening remarks during Monday's, Oct. 22, 2018 community ceremony. Jordan Bluffs is moving forward with the View 72, Phase II development at Jordan Bluffs. The 265-acre parcel will be comprised of mixed-use development on the former Sharon Steel superfund industrial site. Leah Hogsten | The Salt Lake Tribune Jordan Bluffs redevelopment master plan, Monday, Oct. 22, 2018. Jordan Bluffs is moving forward with the View 72, Phase II development at Jordan Bluffs. The 265-acre parcel will be comprised of mixed-use development on the former Sharon Steel superfund industrial site. Leah Hogsten | The Salt Lake Tribune l-r Ken Ivory, R-West Jordan listens as Middle mayor Robert Hale points out places on the master plan, Monday, Oct. 22, 2018. At right is former Midvale planning commission chairman, Allen Litster. Jordan Bluffs is moving forward with the View 72, Phase II development in Middle. The 265-acre parcel will be comprised of mixed-use development on the former Sharon Steel superfund industrial site. Leah Hogsten | The Salt Lake Tribune Dell Loy Hansen, View 72 investor and founder and chief executive officer of the Wasatch Group talks about the project, Monday, Oct. 22, 2018. Jordan Bluffs is moving forward with the View 72, Phase II development at Jordan Bluffs. The 265-acre parcel will be comprised of mixed-use development on the former Sharon Steel superfund industrial site. Leah Hogsten | The Salt Lake Tribune Jordan Bluffs is moving forward with the View 72, Phase II development, Monday, Oct. 22, 2018. The 265-acre parcel will be comprised of mixed-use development on the former Sharon Steel superfund industrial site. Leah Hogsten | The Salt Lake Tribune Melissa Friedland, national program manager for superfund redevelopment with the Environmental Protection Agency said she gave Midvale city leaders and redevelopment proponents credit for being bold innovators in transforming the site, Monday, Oct. 22, 2018. Jordan Bluffs is moving forward with the View 72, Phase II development at Jordan Bluffs. The 265-acre parcel will be comprised of mixed-use development on the former Sharon Steel superfund industrial site. 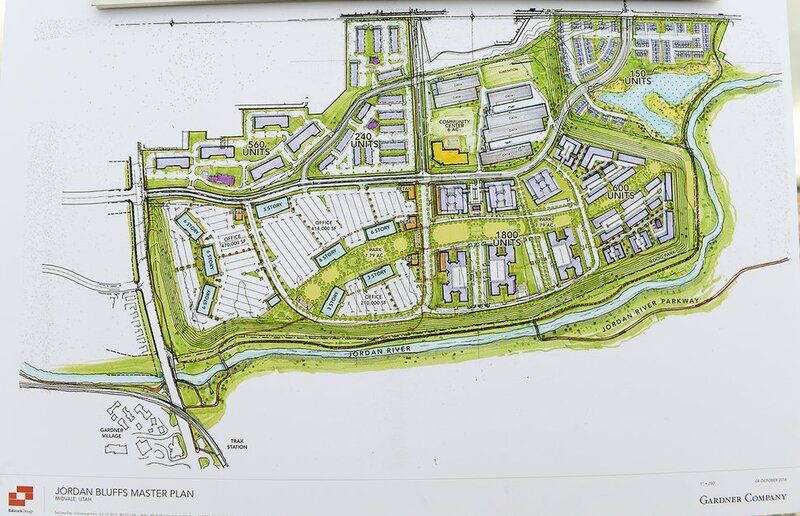 Midvale • In announcing plans for a huge new mixed-use development on the once-polluted former Sharon Steel site in Midvale, leaders said Monday the city had turned a 30-year problem into a source of immense economic promise. Officials said developers with the Salt Lake City-based Gardner Co. and Wasatch Group will build a 265-acre residential and commercial project on the environmental cleanup site, with a redevelopment dubbed Jordan Bluffs. The project is slated to bring more than 1 million square feet of additional office space to Midvale in a series of six-story towers, along with thousands of multistory apartments and town homes, all built around a milelong linear park running parallel to the Jordan River. This would be a second phase to the successful View 72, another development farther north at Bingham Junction, currently a fast-selling housing, office and retail cluster on 351 acres atop what was once a Superfund slag heap. Covering 7 percent of Midvale’s total footprint all by itself, the second phase at Jordan Bluffs will bring added employment, vital intellectual capital and accelerated economic growth for the suburban community, said Mayor Robert Hale. “We envision a great community expansion occurring here,” Hale told a crowd of about 100 officials huddled at a rainy celebration on the barren building site, with its sweeping views of the Oquirrh and Wasatch mountains. (Leah Hogsten | The Salt Lake Tribune) Jordan Bluffs redevelopment master plan, Monday, Oct. 22, 2018. Jordan Bluffs is moving forward with the View 72, Phase II development in Midvale. The 265-acre parcel will be comprised of mixed-use development on the former Sharon Steel superfund industrial site. But Midvale, the mayor said, didn’t do it alone. This phase of View 72 also represents a crucial handoff between the city, private developers and the U.S. Environmental Protection Agency, which once listed both the Midvale slag heap and the metals-contaminated Sharon Steel site on its top national priorities for Superfund cleanup. Decades after alarm first grew over arsenic traces in area groundwater and neighbors using tainted soil from the contaminated site in their gardens, a top EPA official said Monday’s celebration came only after painstaking collaboration involved in the environmental cleanup. The Sharon Steel site saw active ore smelting from 1906 to 1971 that contaminated the air, soil and water with poisonous heavy metals. It was labeled a national EPA cleanup priority in 1990. After many years and millions of dollars of environmental remediation — including moving, lining and capping at least 10 million cubic yards of tainted soil on site — the land was taken off the Superfund list in 2004. Today, city and EPA officials say, the site no longer poses a risk to humans or the environment — though it will be subject to ongoing monitoring and an in-depth EPA review every five years. After extensive negotiations on how to best develop it, EPA officials have made Midvale the supervising agency over the acreage for what is now considered an operations and maintenance phase for the Superfund cleanup process. Smidinger said the EPA also had issued a letter in 2017 to the Gardner Co. certifying steps under which the land could be developed. 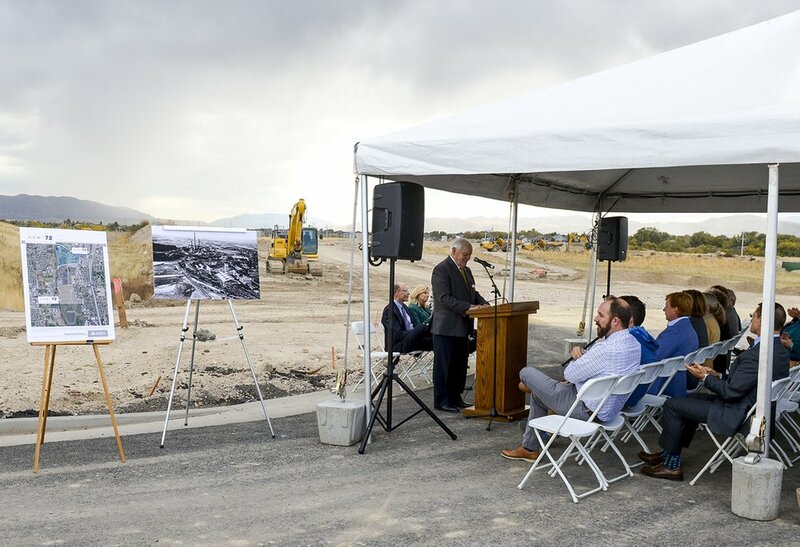 (Leah Hogsten | The Salt Lake Tribune) Midvale Mayor Robert Hale delivers remarks during Monday's community ceremony for Jordan Bluffs, a redevelopment moving forward with the View 72, Phase II, south of Bingham Junction. The 265-acre former Superfund site will be comprised of thousands of new housing units and up to 1 million square feet of new office space, on the former Sharon Steel ore smelting and mining site. Much of the cleanup was also overseen by Utah’s Department of Environmental Quality, and its executive director, Alan Matheson, said the agency had met its top goal of making the land safe for the public. Midvale was among “the best and brightest” of U.S. cities for its vision in rehabilitating lands tainted by industrial use, said Melissa Friedland, the EPA’s national program manager for Superfund redevelopment. The city is also encouraged, Butte said, by demand for office space in Bingham Junction and its successful recruiting of corporate headquarters for companies such as online wholesaler Overstock.com and Zagg, maker of protective covers for electronics. “We’ve always had our eye on this property,” Gardner said. 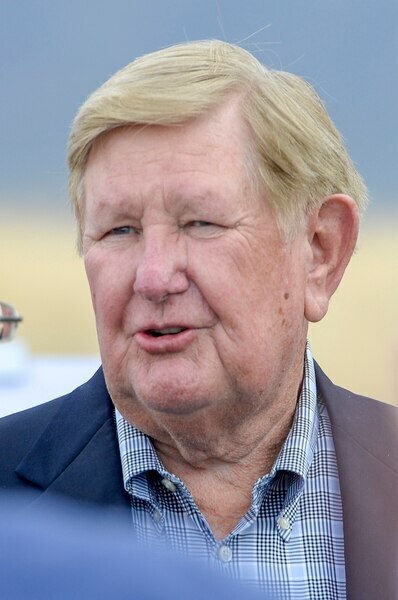 Dell Loy Hansen, CEO of Wasatch Group and owner of Real Salt Lake, said, in addition to high-quality housing, the next phase of View 72 would be heavy on recreational amenities, including indoor soccer facilities devoted to women and youths.